'Love Should Die' is the largest online community relating to Andrew Lloyd Webber's latest train-wreck of a show, LOVE NEVER DIES, a non-awaited and hugely misguided sequel to THE PHANTOM OF THE OPERA that bastardizes the original story by Gaston Leroux and Webber’s smash-hit musical. We feel strongly that Andrew Lloyd Webber's latest musical, LOVE NEVER DIES, is a completely misguided venture that is a detriment to the story of the original PHANTOM OF THE OPERA novel and musical of the same name and that, contrary to the information being reported by the Really Useful Group and perpetuated by the ill-informed media, is neither in the interest of nor desired by the story's many fans. Virtually everything about the show strikes us as illogical, irrational, offensive and frankly stupid. We aim to provide a platform for the many people out there who maintain that this should have never been given the green light and who are disappointed and disillusioned by the decisions of Lloyd Webber, his creative team and the Really Useful Group regarding LOVE NEVER DIES. Now that previews for LOVE NEVER DIES have started in London, the 'Love Should Die' community has suddenly attracted a huge increase in attention. Critics of our 'campaign', as they call it, have condemned 'Love Should Die' as ultimately pointless, because it is, of course, delusional to think that an internet community with a niche common cause will close down a multi-million pound global entertainment product. For this reason, the team of 'Love Should Die' thought we should clarify our position and our objectives. 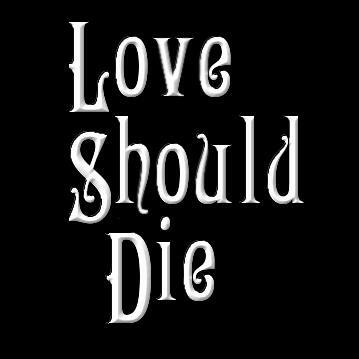 Let it be known here that 'Love Should Die' does not aim to bring about the closure of LOVE NEVER DIES. It doesn't need to. The show is dreadful enough to close itself. Nor do we wish any harm upon the cast or creative team of this completely unnecessary and tasteless venture. As stated on the 'information' page of our Facebook, our goal is to provide a platform for the many devoted fans of THE PHANTOM OF THE OPERA in all its previous incarnations to voice their feelings in condemnation of LOVE NEVER DIES. When news of the show began circulating the media early last year, many articles incorrectly claimed that PHANTOM fans have been waiting for this sequel for years. While this may be true of some fans, we are convinced that they are very much in the minority. Most thoughtful, intelligent, devoted and longstanding fans of THE PHANTOM OF THE OPERA have never wanted this sequel to happen. When Forsyth's flop novella, THE PHANTOM OF MANHATTAN was first published, they read it, despised it and rejected it. By default they have done the same of this sequel, as, despite the claims of Lord Lloyd-Webber, it has always been clear that the story of LOVE NEVER DIES was to be based---however loosely---on Forsyth's ridiculous plotline, and indeed this week this fear was confirmed. Furthermore, it would not have mattered what the story of LOVE NEVER DIES was: the fundamental point is that any sequel to THE PHANTOM OF THE OPERA inherently diminishes the emotional power and impact of the original story, in particular its conclusion. 'Love Should Die' was established not to prevent the sequel from happening; indeed, it was set up after the official press launch for the show in October 2009. The idea that this group could prevent the sequel from reaching the stage was never considered. Our aim is merely to counter the offensive claims by those promoting the show, in particular those of its producer, the Really Useful Group, that PHANTOM fans cannot wait for this sequel. This, coupled with the aforementioned lazy journalism, creates a completely erroneous impression of the reaction to the show from its core demographic: fans of THE PHANTOM OF THE OPERA. Our aim is to rectify this. The media must understand that vast numbers of PHANTOM fans, many of whom will inevitably be ignorant of our presence on the Internet, have never desired this sequel and do not desire it now. We accept it has happened and will transfer across the world. But we do not accept that, as fans of THE PHANTOM OF THE OPERA, we must automatically subscribe to its ideas. As a result of our encouragement of dismayed fans to voice their opinions, the situation is thankfully beginning to change. In the last few weeks, several media sources have now acknowledged that passionate devotees of THE PHANTOM OF THE OPERA are either against or are at least extremely skeptical of LOVE NEVER DIES, these being the THE GUARDIAN, THE DAILY TELEGRAPH, THE NEW YORK POST, THE TIMES, THE AUSTRALIAN, THE STAGE, THE GLOBE AND MAIL, THE DAILY EXPRESS and the website 20MINUTOS.ES. Our aim, therefore, is to ensure that, come opening night in the West End, on Broadway and around the world, those who might have incorrectly assumed that PHANTOM fans would automatically like the 2004 motion picture adaptation of the stage musical do not make the same mistake. It is a shame that the PHANTOM fandom has been divided---perhaps in some cases irreparably---as a result of this sequel, but this non-uniformity of opinions is a fact that the outside world must reflect correctly. That the aforementioned newspapers have recently begun to take notice of those fans who do not support LOVE NEVER DIES---even if this is at the cost of being labelled 'diehard fanatics', which perhaps some of us are---assures us that our efforts have not been in vain. Our mission is thus already successful. But there are still many false perceptions yet to correct, and as long as they exist, we will continue to speak out.